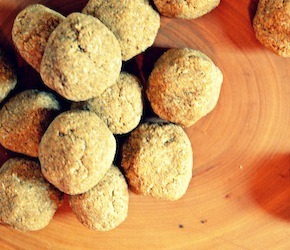 These grain-free cookie-like macaroons are chewy, spicy, and delicious. Place all ingredients into a food process and process until a textured paste forms. Using a spoon and clean hands, scoop heaping tablespoons of batter and shape into balls with your hands. Place on a parchment-lined baking tray. Bake in a 350 F oven for 10-12 minutes. Makes 16 macaroons.